The Magic Castle is a performance venue, restaurant and private club. A typical evening features several magic and sometimes variety arts performances, as well as a full service dining room and several bars in a country club atmosphere. A dress code of formal party attire is strictly enforced. Entry is only allowed to members and their guests. 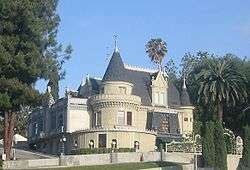 The principal building of the Magic Castle is a Chateau-style or Chateauesque residence built in 1909 by banker, real estate developer and philanthropist, Rollin B. Lane. The house was designed by architects Lyman Farwell and Oliver Dennis and constructed as a near duplicate of the 1897 Kimberly Crest House and Gardens in Redlands, California that the architects had designed over a decade earlier. Ownership of the building remained in the Lane family until 1955 when it was sold to Thomas O. Glover, whose family still owns the property. In September 1961, the building was leased to Milt Larsen, Bill Larsen., and Irene Larsen, who began converting it to its present state. The Magic Castle opened for business on January 2, 1963. Over the years several additions have been made to the original structure, allowing for the inclusion of several theaters, bars, a library and other meeting spaces. The Magic Castle was declared a Los Angeles Historic-Cultural Monument in 1989. One of the Castle's most famous performers was the late Dai Vernon, an expert in sleight of hand, who often sat in the bar area entertaining and teaching. Vernon was the Magician-in-Residence at the Castle for many years, up until his death in 1992. Other famous magicians who have been regular performers at the Magic Castle include Mark Wilson, Jay Ose, Senator Crandall, Johnny Platt, Kuda Bux, and Billy McComb. Many "celebrity magic hobbyists" have also performed at the Magic Castle, including Cary Grant, Steve Martin, Johnny Carson, Neil Patrick Harris and Jason Alexander of Seinfeld. On October 31, 2011, the Magic Castle suffered damage from a fire that broke out in the attic. Significant interior refurbishing was necessary as a result of extensive water damage caused by fighting the fire. The Magic Castle was reopened in its entirety in February 2012. Although begun in 1952 as a loose association of magicians by William Larsen, Sr., the Academy was incorporated and its organization formalized in 1962 by his son, William Larsen, Jr., who together with Milt Larsen, another son of William Larsen, Sr., built the Academy into an international organization whose headquarters has been the Magic Castle since 1963. There are nearly 2,500 magician members in the Academy today. To become a regular member, one must first be actively practicing or involved with magic as a career or hobby and audition before the Academy's membership reviewing committee. Associate members are people who love magic and the academy. Most of the members are in the entertainment business, law, finance, and medical fields. Some of these associate members are friends of magician members who enjoy the atmosphere of the Academy. Associate Member applications must be approved by the Board of Directors. Honorary members and VIP members are presented by the Board of Directors to magicians, celebrities and individual members of the Academy who have contributed to the advancement of the art of magic. It is also possible to become a junior magician if you are between the age of 13 and 20. Membership in the Junior Group is open to anyone seriously interested in magic who is from 13 to 19 years of age. One may apply if 20 years old, but must be able to be a member in the Group for one full year. These junior magicians are only allowed limited use of the facilities. You must be a talented magician to get accepted through audition. The Academy of Magic offers classes that are available to the public. The Basic Magic class is designed to provide the skills and knowledge necessary to perform basic magic. The class combines instructor presentation, step-by-step explanation, hands-on instruction, group practice sessions and individual performance. Classes are held one night per week for six weeks, from 7:45 p.m. to 9:45 p.m. During the six weeks, the students receive a temporary six week pass that grants the privileges of a regular member, excluding magician member's lectures. They are allowed to bring four friends to stay at the castle, but not to the classes. Men must wear a coat and tie and women must wear a dress or skirt; no casual wear is permitted. Other awards include Literary and Life Fellowships awards which go to individuals who, in the view of the Academy, have made significant contributions to the field of magic. 1985 William W. Larsen Jr. The Monk episode, "Mr. Monk and the Magician" was shot on location in the Magic Castle. Actor and magician Steve Valentine was filmed in the theater's auditorium with Jarrad Paul and Tony Shaloub, using his talents in the role of the evil magician Karl Torini, who murdered a friend of Monk's and became a formidable adversary. Neil Patrick Harris commissioned a Harry Houdini aquarium for installation at the Magic Castle in 2012. The aquarium was built by the team from the TV show Tanked. Clips from the show Tanked featuring the Magic Castle's aquarium. Scenes from the Netflix series "Love" episode, "Magic" were filmed at the Magic Castle. 1 2 3 Department of City Planning. "Designated Historic-Cultural Monuments". 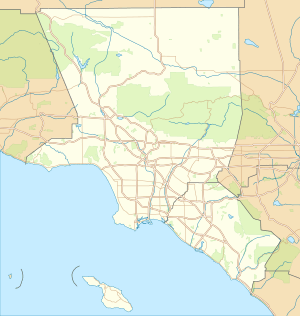 City of Los Angeles. Retrieved 2012-10-03. ↑ "About". The Magic Castle. ↑ Johnson, Karl (2005). The Magician and the Cardsharp. p. 282. He was cremated, and after the box with his ashes was brought to the Magic Castle, it was placed for display on a ledge at the top of a wall filled with photos and other memorabilia from his long life in magic. The ledge was so high that the box was almost out of sight. ↑ Blankstein, Andrew (November 1, 2011). "After fire, Magic Castle hopes to reopen Friday". Los Angeles Times. ↑ "Castle casts spell on Larsen clan; Founder tells his and club's history". Daily Variety. September 14, 2006. Retrieved 2009-07-21. 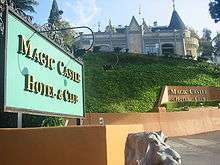 ↑ "Magic at the Castle this weekend". Redlands Daily Facts. July 1, 2004. Retrieved 2009-07-21. See more about Magic_Castle at MagicPedia, the free online Magic encyclopedia.